True love knows and one doesn't have to wait for the Valentine Day to express it, specially for someone who has just days left to live. Here is a stunning example of expression of love by a wife who had two weeks left for delivery, but when she is told that here husband has only few days left to live, she induces pre-mature labour to have her daughter born so that her husband could see it. 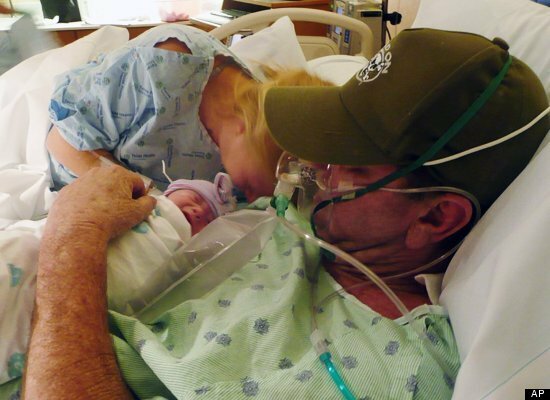 Diane Aulger, wife of 52-year old Texas man Mark Aulgar had her daughter born through induced labour on Jan 18. When tiny Savannah was placed in his arms, Mark Aulger "cried, and he just looked very sad," his wife said. Mark died five days later from complications related to his cancer treatment.